How did you first learn about post-graduate service? Throughout middle school and high school, I would often hear about the Peace Corps. I strongly considered this option, and even went through the majority of the application process. I did not want my first time away from home to be a two year commitment in a different country, so I decided to look at other options. I discovered AmeriCorps, which, in my opinion, is needed just as much as the Peace Corps, but is talked about much less. I explored the many options that AmeriCorps offers, and ended up in Kentucky! 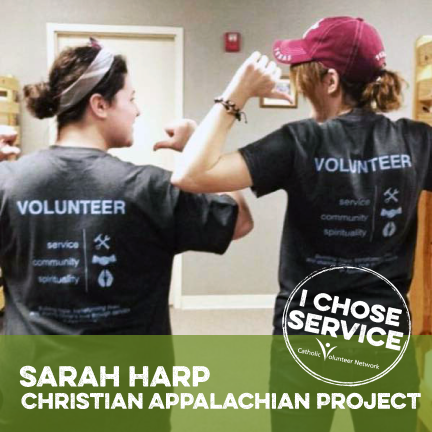 What other options were available to you, and why did you decide on the Christian Appalachian Project? I considered, and quickly dismissed, the standard post-grad options of either going to grad school or getting a job. I lived near a city where I could get some sort of job pretty easily if I was willing to do anything. And I thought about grad school, but it did not feel like the right time to do that for myself; I was not even sure if I wanted to work within my undergrad major or do something completely new. I decided to do service because helping others is an important part of life, and I strongly believe that giving time to an organization for an extended period of time is something everyone should consider. I knew that I would feel more fulfilled volunteering rather than having a job I was not sure about or making money, but not helping others. Service was the right choice for so many reasons, and I think I would regret not taking the time to do this work. Once you are settled down with a job or family, it makes taking time to volunteer a lot harder, so being a new graduate is the best time to do long-term service. What has your service experience been like? I am working with the Christian Appalachian Project (CAP) in Kentucky, and, more specifically, I am working in the Child Development Center, which is a preschool that serves children ages three to five. Working with these kids, and watching them make progress and succeed, is truly rewarding. Without this center, children in Rockcastle County would not have a preschool to go to, so this center, and myself as a volunteer, is truly making a difference in the lives of these children, their families, and the community as a whole. All CAP volunteers live in a volunteer house, so we all have chores and take turn making dinner for one another. My house specifically has four volunteers, but there is another house across the street as well. Being a Christian organization, we are also required to do devotionals after dinner, which we eat together four times a week. On the weekends, we often do something as a community. I have done a lot more contra dancing than I ever thought I would, and we have also gone to the movies, dinner, art classes, or have simply driven the backroads of our town. I have made friends that will last a lifetime through my service here. What benefits have you gained from this experience that you might not have received otherwise? I have learned so much during my time in service, which has only been a little over three months so far. Working with children is not something I went to school for, or ever really pictured myself doing, but that is what I chose to do when I came to CAP. The teachers at the center have taught me so much. I have my own small group of children that I get to teach everyday and watch them learn. I have had moments that I like to call “teacher moments” when you are showing the children something and their eyes light up with excitement and intrigue. A specific time was when we were putting food dye into a pudding mix and they were all so amazed at the color changing as they each took turns stirring the mix. I have been through paid for CPR training as well as some online training for working with children. I have come up with lesson plan ideas, created bulletin boards, and, most importantly, I get to play with children everyday and help them learn and grow as individuals. While in Kentucky, I have learned a lot about myself and how I interact with other. I have also shaped my opinions on life and helping those in need from experiencing the need, and I have eliminated several stereotypes from my mind about poverty and what causes it. I have become more self-aware, and a little less ignorant to the needs of those around me and the possible causes for those needs. Also, working and living within a Christian organization has really helped me with my walk with God. I have learned a lot from my housemates, some ideas I agree with along with some that I do not, but everything I have learned has made my faith stronger. I have met some of the strongest Christians and I have learned a lot about God and faith through their testimonies. This was a huge relief coming from a secular college where God either was not talked about at all, or talked about in a negative way. What advice do you have for someone considering post-graduate service? I would tell anyone even slightly considering post-graduate service to do it. Do not worry about what seems to be normal after graduating, and do not worry about the money. It is rewarding in so many other ways. When serving, loans can be differed, and it is not hard to find volunteer opportunities that provide some sort of housing or a stipend to live off of. Giving what you can should be a practice in life for everyone, and doing so while you are young is beneficial: it builds character, you are not tied down anywhere yet, you do not have as many bills to pay for yet, you do not have a job to give up; you do have the time, the energy, and the ability to serve, so do it! Once you have a job, family, house, etc., it becomes a lot harder to do long-term volunteering, so doing it directly after graduating is really the best time for most people. Through volunteering, I have already accumulated so many skills that you can use in the future. I have new skills that will look great on a resume, and I have gained general skills that will simply help me throughout the rest of my life. I have traveled out of my state, and have learned about a new culture: there are so many different cultures that make up America, we can not just pin America to one culture. This town, county, state, has opened my eyes to so much more than my town in New York. I am glad I chose to do service instead of getting a job right away. It has been an extraordinary experience that has helped me grow as a person and has opened my eyes and heart to serve for the greater good. I would like to end up with a job that is working with a non-profit or doing something to serve others, but even if I do not, I will continue to make service a part of my life long after the year I have committed to it.